What will they think of next? 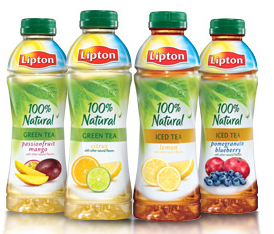 For those who are DirectTV subscribers you can grab a FREE sample of Lipton 100% Natural Iced Tea! Please note that you have to be a Direct TV subscriber AND your receiver has to be connected to either a phone line or a broadband connection. Now just turn to channel 112 and you should see a screen (like the one below), then click on the “Get a Free Sample” box and follow the directions. Allow 4-8 weeks for delivery.